Traditional phase sequence measurement methods must poke the three-phase wire terminal, and connect the three bare alligator clips or test pins of phase sequence meters to the three bare firing lines, while Citek 50810A uses clamp non-contact measurement, without taking off the wire and no need to contact high-voltage bare fire-wire, the test can be made by directly clamping the three-phase insulating sheath by three super-sensitive high-insulated clamps. Conducting measurement on sheathed cable significantly improves the safety of field testing, effectively protect the operator’s personal safety and increase productivity! More sensitive Citek 50810A clamp, can even sense the AC voltage signal as low as a few Volts, with a wider range of live electricity. 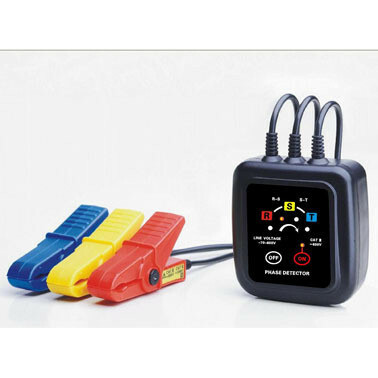 The three clamps of Citek 50810A are in three colors, Red, Yellow and Blue; It is more in line with the distinction of three-phase line, and more scientific and artistic overall appearance. Citek 50810A has a better power-saving performance with the maximum rated power of 100mVA. After 3 minutes, the meter automatically cut off power supply.